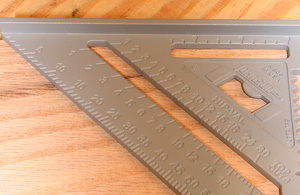 This is a very well-made tool that deserves our attention because it is also Made in America! The markings for many cuts (left) such as rafters etc are clean and easy to read. Of course you can lay out perfect angle cuts (right) easily. 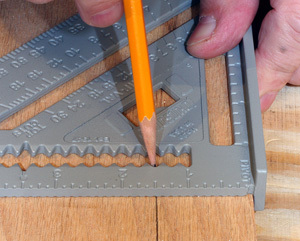 The nifty jagged edge window (left) is for scribing perfect lines along the length of a piece. 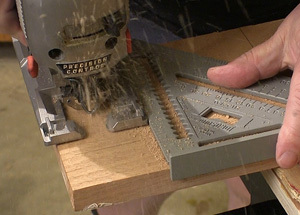 And we can use this square for guiding a saw to make nice square cuts. 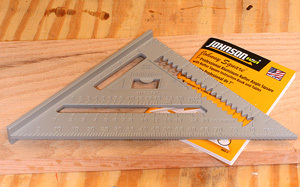 The Johnson 7" Johnny Square® is another example of a common tool made right. The fact that Johnson chose to manufacture the Johnson 7" Johnny Square® in America is a plus that I think needs to be rewarded with our patronage. I constantly hear people complaining about tools made overseas. 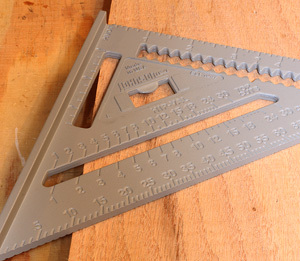 Here is your chance to support an American tool-making effort. The Johnson 7" Johnny Square® has a retail price of $12.99 (12-3-2012) and I expect on the street that cost will go down a bit further. This is not long money for a nicely made tool that actually has many uses in our shops. The fact that you can support American workers at this price should be a no-brainer.